One harsh November evening in 1961, Paul Miller and three buddies were on their way home after a hunting trip close to Minot, North Dakota. Suddenly, something they described as a “glowing silo” landed on a nearby field. They first believed that it was an airplane that had crash landed, but they were forced to change their minds when the object suddenly disappeared. 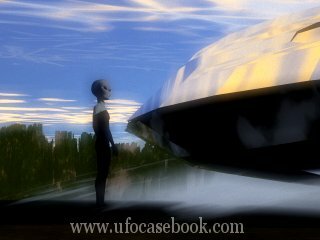 But when the four decided to drive away, the object reappeared and two humanoids stepped out of the craft. Miller, who was struck by panic, shot one of the beings, apparently injuring it. The second being fled. On the way home, Miller and his team had a “blackout” and lost track of three hours. They then decided not to tell the story to anyone. The next day when Miller arrived at his office (at the Air Force), he was visited by three men wearing black suits. They said that they were from the government and they began asking questions about his encounter and Miller later recalled “that it seemed that they knew everything about me, and they probably already knew my answers”. Instead it seemed that they were more interested in what clothes Miller had worn at the time of the encounter and the men followed Miller home to take a look at them. The men made such a threatening impression on Miller that he didn't dare to tell his story for many years.